Solo - Carmen will bring sparkle and entertainment to any occasion - birthday parties, weddings, corporate events, etc. ...Whatever your celebration! A performance to pre-recorded music comprises either one or two sets, each lasting approximately 15-20 mins. Group - Club Cairo can supply numerous dancers depending on your requirements. Mazaj - A vibrant sensory experience straight from the heart of the Middle East. A combination of Belly Dance, Oud, Arabic percussion and a whole array of traditional wind instruments. The distinctive rhythms and lyrical beauty fused with the elegance of the dance will lift the spirit and transport you to a place of magic. Souk-Bab-El-Louk - Razzle, dazzle, shimmy and shake! Their passionate joyous music combines Middle Eastern melodies with a percussive drive and a tough bass groove. Please see the Calendar for details of upcoming performances. Prices vary depending on your requirements. Please contact us for details, or to arrange a booking. Another exciting aspect to our evenings has been the introduction of theatre. Again, combining the traditions of Middle Eastern music and dance but this time with drama. Each production is historically based and then transformed into an abstraction of sight, sound and movement with a difference. Drawing on the roots of tradition yet branching out to explore new forms of expression. A provocative and super-sensory experience combining fantasy with reality. A celebration of live music, dance and theatre from the Middle East and beyond. A super sensory experience aiming to inspire, educate and bring fun and fantasy to the audience. Our theatrical production "The Serpent Slayer" is an original story that combines the harsh realities of modern day life in the Middle East with the magic and fantasy of an Arabian fairy tale. The cast of dancers and musicians combine with poetic verse and multi-media projections to tell this tale. The entertainment then continues in the form of a live and light hearted set of traditional songs played by Club Cairo's musical ensemble who will be accompanied by a dazzling array of belly dance artists. An enchanting fairytale from the East filled with marvels, magic and wonders. A mother/child relationship that endures many twists and turns in a world steeped in fantasy and adventure. 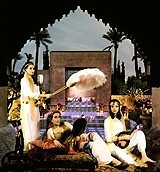 The Arabian Fantasy Dance Theatre combine live music, dance and theatre to create a captivating experience. The origins of the dance in this company in essence are Middle Eastern. However this production also combines contemporary and ballet dance to express the true nature of the characters. Our live music ensemble combines traditional Middle Eastern and western instruments with modern sounds too. The soundtrack for this show is particularly other worldly and really enhances your journey through each scene. We also use multimedia projections to add more dimension, colour and expression. This again adds another expressive layer adding a further burst of life. And of course we have our storyteller, who joins the characters on their journey giving them a voice as well as retelling the tale so eloquently. Club Cairo also invites guests to perform from around the world. India, spain, Iran and South America - a wonderful addition creating an even more potent experience. Other videos and photos are available on the Gallery section.